Wrap a sandwich, cheese, vegetables, cover a jar and so much more! Using our wraps is as simple as 1, 2,3. Use the warmth of your hands to shape the wrap. The wrap will cool over anything, creating a tight seal. Simply wash with cold water (optional soap) and reuse. A little love goes a long way. With proper care, you can expect your Wrappini wrap to last at least six months. All materials used are natural so deeply pigmented foods may contribute to the personality of your Wrappini. You can minimise staining by rinsing the wrap in cold water shortly after food has been removed. Avoid prolonged contact with oily or greasy foods. For best results and longevity, hand-wash your wrap in cold water with dish soap regularly. We recommend biodegradable, alcohol-free soap as beeswax is soluble in alcohol. Check the ingredient list of your dish soap, if alcohol is in the first five ingredients listed, it is too harsh for your Wrappini. It's only in cold water that the beeswax coating will be stiff enough to provide a stable surface for cleaning. The wraps are washed like a plate, not a piece of fabric. They can handle a light scrub with a gentle dishcloth or sponge. 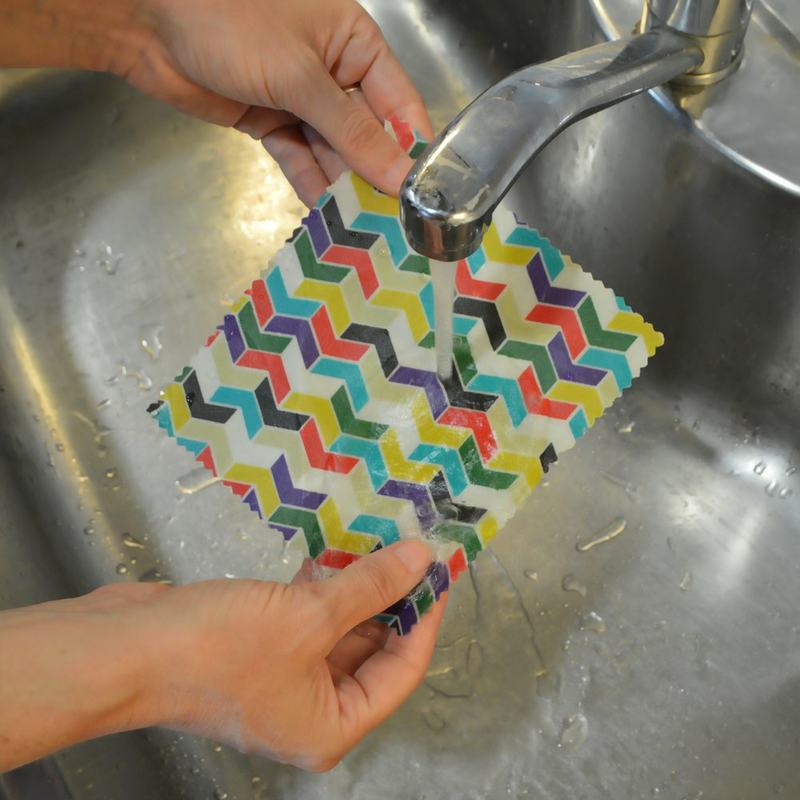 Dry your freshly washed wrap with a towel for immediate use or place over a dish rack to air dry. Do not wring out, stretch or unnecessarily bend your wrap. Warning: Your Wrappini is not suitable for the dishwasher, washing machine, microwave or oven. In general avoid all direct heat, open flames and high temperatures. Allow food to cool slightly before covering and avoid placing hot food directly on your wrap. You may put your wrap in the freezer but it's not recommended for longer than a few weeks.